Posted by Edwin Ritter in Cloud Computing. Among the technology trends this year, I am focused on three in particular. I have previously covered big data. In an upcoming post, I wil look at the personal cloud. 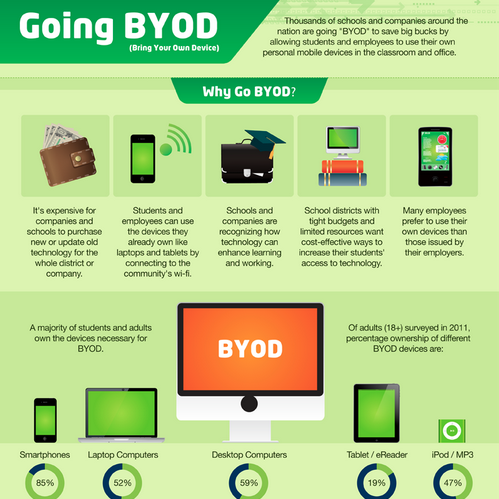 This post talks about mobile devices and the BYOD phenomenon. The term stands for “Bring Your Own Device”. At work, we increasingly use our smart phones to access applications, email and stay in sync. The big assumption here of course is that your IT department can support this. Any time, any place – tracking your calendar updates for meetings, checking email, updating wikis all can be performed easily via your smart phone. For road warriors, using your existing smart phone is now routine. Office workers are realizing the advantages of being able to access data outside the office as well. This infographic shows a few ways how this trend is being used. There are real advantages with BYOD – here are a few. A reduction in the hardware cost is one. Having the employees upgrade to the latest smarthphone, tablet, laptop, etc. eliminates a lot of cost for the organization. The devices are omni-present; the data is constantly available. You are engaged and in touch more often. Policy changes are part of this phenomena. IT will typically require secure network access. Once you connect to the internal network, you are on your own. Remember your credentials and keep them secure. After that, enjoy and keep your device charger handy and let the cloud process for you.